I am in a unique position to espouse the virtues of sales and marketing alignment – I am the head of sales at my company and am married to our chief marketing officer. I know that sales and marketing alignment is critical to an organization’s success, and yet I also know the inherent challenges. I live with marketing (truly) and sometimes alignment still evades us. The disconnect between marketing and sales teams has long been an industry-wide, hot-button issue, with both sides claiming communication is key but typically shying away from any real-world, concrete solutions for creating that communication. In fact, according to a recent study by Demand Gen, 49% of marketers and sales executives agree that communication is the biggest challenge in aligning teams. But research shows that business booms when marketing and sales can overcome the gap between the groups for the good of the brand. An Aberdeen Group study found that businesses with highly aligned sales and marketing teams earned an average of 32% year-over-year growth, while those who reported less alignment saw a 7% decrease in revenue. Ouch. Takes alignment out of the nice-to-have category and puts it squarely at the top-of-the-growth agenda. If aligning marketing and sales teams is so critical for growth, then how come it’s so hard to get the two groups together to focus on a clear content marketing strategy? I’ve found that the solution could lie in setting clear goals, outlining what each side wants from the other, and then using those goals for content creation. When Demand Gen asked sales what they most wanted from marketing, the No. 1 answer was better quality leads, followed closely by more leads. And there’s plenty of evidence to support the idea that better content equals better leads, since most buyers are already nearly a third of the way through their journey before they even contact sales teams. The further online the buyer’s journey goes, the greater the responsibility is for marketing to create effective content that supports that journey. Content that educates the buyer and stands out from competitors is crucial in this initial phase, and I have to say here, this is where interactive content has made all the difference for us. Research has shown that interactive content is 93% effective at educating the buyer (more than double static content), and it’s 88% effective at differentiating brands from competitors (more than a third better than static content). But what’s seldom discussed is that interactive content, like ROI calculators and assessments, can act as invaluable tools in a sales associate’s arsenal for gauging where customers are in their life cycle and making sure that they’re getting personal, relevant attention as soon as they’re ready for it. As marketer Mark Yeager recently wrote, “Content fails when you create materials that speak to very broad audiences.” And static, impersonal content meant to appeal to the masses could be failing not just your customer, but also your sales team. As anyone who’s sheepishly deleted a failed tweet or an unloved Instagram can attest, it can be difficult to drum up interest from relative strangers. What most savvy sales teams quickly realize when they start integrating great content into their strategies is that opening gaffes are more easily avoided with interactive content. Studies show that the majority of customers prefer custom content, so it stands to reason that they would also like sales teams to show a personal interest in their unique needs and preferences during the sales process. Our sales team sends useful tools to their prospects and tracks results in real time. Suddenly, a prospect thought to be very qualified is disqualified based on her assessment answers. Or a half-hearted lead jumps to the top of the heap based on his solution-calculator results. Now, marketing doesn’t have to tell us in sales how great something is for our prospects, we can see it ourselves. While we’re on the subject of communication between the sales and marketing teams, let’s look at what marketing wants from sales. According to the same Demand Gen study, 34% of marketers want better lead follow-up from sales teams, which seems ironic since sales mostly wants better leads from marketing. The problem is somewhere in the middle – a failure to use audience interaction with content in meaningful ways. For example, when potential customers interact with content, be it testing their knowledge in an assessment built into a white paper or taking a quiz built into a blog post, they’re giving brands a clearer picture of what kind of engagement they want. However, failure to acknowledge that engagement is a missed opportunity – be it from a marketer who doesn’t use audience data to create more relevant content in the future or the sales associate who doesn’t follow up with a lead whose answers indicate she’s ready to buy. A unified approach to data from interactive content creates a feedback loop that can be useful to every aspect of the buyer journey, from lead gen to closing the deal. Great insights from content interactions don’t do anyone any good if sales doesn’t have that hustle, hunger, and fire to follow up when they see a great prospect content interaction. In the end, sales and marketing want the same things: better leads and more relevant conversions with ready buyers. Giving the sales team interactive content serves both purposes by providing data about where buyers are in their journey and acting as a gateway to further communication. And the result may very well be a 70% boost in conversions, which is definitely worth starting a conversation. 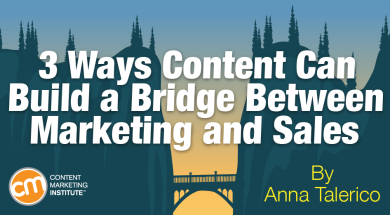 Want more tips and tactics to help your content build a bridge between sales and marketing? Check out the 2016 Content Marketing Playbook. Editor’s note: ion Interactive is a Content Marketing Institute benefactor, which is a paid supporter of our website and content creation activities. As one of ion's co-founders, Anna is passionate about building the company's culture, team and customer success. She leads ion's sales & client service teams, focused on the growth of the customer base and the seamless delivery of both professional services & software. Follow her on Twitter @annatalerico or connect on LinkedIn.